For me, there is nothing more exciting than heading into the unknown, with high hopes of what you might see. Just being out there is an adventure in itself! Born and raised in Cape Town, South Africa, Richard Visser has always had a passion for the bush, and the great outdoors in general. When he was very young, he spent as much time in the bush as he could, exploring and discovering new places. Richard turned this intense passion and love for the bush into a career as a professional safari guide, spending ten years at various lodges and game reserves around South Africa—Amakhala Game Reserve in the Eastern Cape, Kruger National Park, and Tswalu Kalahari Reserve in the Northern Cape Province in an area known as the “Green Kalahari.” Richard also worked in East Africa at Tanzania’s Selous Game Reserve. Here, he spent a year training guides and building Selous Wilderness Camp on the southern banks of the Rufiji River. 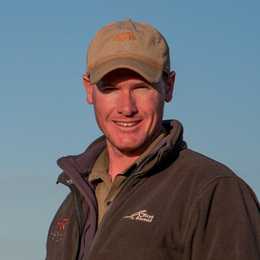 Richard received a diploma in Game Ranging and Lodge Management and has earned Field Guides Association of Southern Africa’s (FGASA) Level 3 qualification, as well as two additional qualifications—Trails Guide and Specialist Birding for Arid Regions. While in Kruger National Park, Richard bought his first camera, and since then, photographing the natural world has become an insatiable passion—one that he shares with many of his guests. Richard returned to Cape Town in 2014, and now enjoys showing visitors the surrounding areas, as well as leading privately guided safaris all over Southern and East Africa. He enjoys sharing the wonders of this breathtaking environment; from approaching Rhino on foot to crawling up to Meerkats and Pangolins, this is truly a phenomenal habitat to explore. Not only is Richard a wealth of information, he is an incredible guide—kind, attentive, always upbeat, and passionate about his job and what he does—a real gem! Ask Richard a question about his upcoming expeditions? Animal behavior can be described as the scientific study of the wild and wonderful ways in which animals interact with each other, with other living beings, and with the environment. As a viewer, we can also learn to predict how a specific animal is going to react to us as humans, based on the manner in which it is currently behaving. Observing an animal on foot, during a walking safari in its natural environment, and having that animal carry on with its daily routine like you are not even there, is one of the most thrilling experiences to witness.